Has it really been only three months since the beginning of the semester? because it feels like forever ago. For Thanksgiving, we went to Indiana, a land of cornfields, cold weather and delicious Kentucky bourbon pecan pie (pretty sure the bourbon was cooked out). My roommate Ilana had family and was nice enough to invite me to join them for Thanksgiving. We had delicious free range turkey (I really shouldn't eat things like that, can't afford to get them...), stuffing (blech, not my thing), creamed corn, loaded mashed potatoes, Zingerman's rolls (it's a ridiculously overpriced deli in Ann Arbor), and a green bean casserole made from a Paula Dean recipe (which, surprisingly didn't have butter or cream in it, but was so rich anyway). On the way there, we stopped at a place called The Chocolate Garden, because we thought it would be a garden of chocolate, it wasn't. It was a ridiculously priced truffle place, where I got the best truffle I've ever had and only had to shell out $5.79 for 2 (ridiculously priced). On the way back, we took a detour through rural America and I realized that Indiana is the state everyone passes through on their way to something else, probably for good reason, it was awfully bleak. Semester is almost over, finished a 30ish page research report last night at 2 am, woohoo! Not that I'm counting down or anything, but 17 days until I get to go home. And, only 16 days until Tron, please enjoy the following picture of Jeff Bridges. The best thing about moving to Michigan, I am only 4 hours away from Chicago! So, for fall break, my roommates and I went. We packed small bags, hopped on the 7:30 am Megabus (it was totally worth the $8 ticket) and went to Chicago. It was awesome. I haven't been since I was probably 10 or 11 (I think I was in 5th grade). We got lost on the streets, went to Millenium park, had fantastic deep dish pizza (so, so, so good),went to iO (improv olympics, where we learned that record keepers keep records, not tears) went to the Museum of Science and Industry, visited the Japanase Gardens left from the World's Fair, rode the bus and El (I love public transportation, seriously), wandered around a tragically hip part of town, got our hairs cut, went to the Art Institute, missed our train home, rented a car and drove back. It was quite the couple of days, so much fun! I hope to do it again sometime! Pictures from the Jim Henson exhibit, I took this before I saw the no photography sign! So, when I came to visit Michigan in March, I met a couple of people and, as luck would have it, we all decided to come back for school. So, we decided to find an apartment and be roommates. It's turned out really well actually, we're all in the program together, none of us is really from around here (so we're all learning the town together) and we have similar sick senses of humor (a big plus for me). Adriana is from West Virginia, she's an Archives and Records Management Specialization. She likes cats, harlequin romances (who doesn't?) and old movies. Ilana is from Seattle area, she's also a Library and Information Services Specialization. She also likes cats, harlequin romances (especially if they're from Dollar General), Pina Coladas, and getting caught in the rain. This is our cat, I am not really a cat person, but I have a love/tolerate relationship with this cat. We got her from the Washtenaw Human Society. Her name is Penelope Haifa Goldstein, Penny for short. We're raising her Jewish, and her middle name comes from the best falafel place ever. Anyway, I love being here and I love school, it's such an adventure. I am a slacker, or I have just been very busy. Probably the latter. Summer was awesome, camp went very well and I had a great time with the new staff as well as all the old ones who visited during the Reunion. It made me really happy to be up there again and it was a fitting end to my time of working at Brighton (I'll never say never, but most likely not again). After camp ended, I had exactly one week to pack, box, throw away or donate pretty much everything I own. It was a harrowing experience, because I didn't realize how much stuff I have. After all the packing was done, I stuffed everything into my Subaru Legacy and it all fit with even a little extra space. Friday night, we had family and friends over for dinner and root beer floats. It was great to see everyone before I left and they got a surprise because I was actually leaving at 10:30 that night! My brother served his mission in Topeka, KS and wanted to get there in time to go to church on Sunday, which was a 17 hour drive. So, we left 10:30 pm on Friday and arrived at 7:30 pm Saturday, exhausted, but strangely invigorated. I should also mention that many of my Brighton friends stayed Friday to say farewell, by lining up on either side of the car and cheering, it was quite the farewell, one that I'll not soon forget. Sunday, we went to church, then we drove to Kansas City (which is only an hour away) and stayed there for the night, it was really near Independence and Liberty, so we could go to some church history sites. Monday, we drove to Adam-ondi-Ahman, which was incredible, then we went to Carthage and Nauvoo, we ended up staying in Keokuk, IA, right across the river. Tuesday I was lucky enough to go to a temple session at the Nauvoo temple, which was awesome and really set the tone for my trip across the country. Tuesday, we also drove about 3 hours to a little town in Illinois (about an hour outside of Chicago) and stayed the night. Wednesday, we arrived in Ann Arbor! Then the unpacking and shopping began. I went to Ikea and got a desk and a bed, but they didn't have a foundation, so I had to sleep on the floor the first couple of nights. Thursday was busy with shopping again as well as unpacking and cleaning. Unfortunately my brother was not feeling well (stomach flu) so he had to stay in bed most of the day. Friday we found a box spring and frame at Sam's Club and I finally started to settle in. Saturday we went to the Henry Ford Museum outside of Detroit and it was incredible, although overpriced. My brother even liked it (probably because it had a lot of cars and trains). Sunday, I had to say goodbye to Greg as he left for home and now I'm on my own. I won't bore you with the details of this week, but it was full of shopping (there are a lot of thrifts stores in Ann Arbor, I already have my halloween costume even! ), organizing my room (it's almost done), Orientation (Boring, because most of the things were already general knowledge) and bonding with my roommates (more on them some other post). Anyway, I'm really excited for school to start tomorrow and it's been an awesome experience already (it's great when you feel as though you're exactly where you need to be). Roommates for the Second half, Yellow, me and U! Brighton Staff posing in the parking lot after we said goodbye to the girls. So, I've been getting ready for camp, school and moving to another state. I'm trying to condense my entire life into the back of a Subaru Legacy, which is slightly larger than a Subaru Outback, so that's good. Camp keeps getting nearer and nearer, I'm not nervous, its just been 4 years, so I'm anxious because I haven't done it in a while. I'm also a bit anxious about school. Suddenly I'll have these flashes of insanity where I'll realize I'm going to be a Graduate student and I feel highly inadequate to do something like that. I know I'll be fine, but I feel I don't fit the mold of a general Grad student. Every time it happens, I feel guilty about watching so much TV (can I say, I've really cut back on the TV and movie viewing, but I'm addicted to Craig Ferguson, so funny) and not reading as many books as I could/should. Then I realize that my fears are all stupid and I'll be fine. So, that's my secret confession, not very interesting I'm sure. 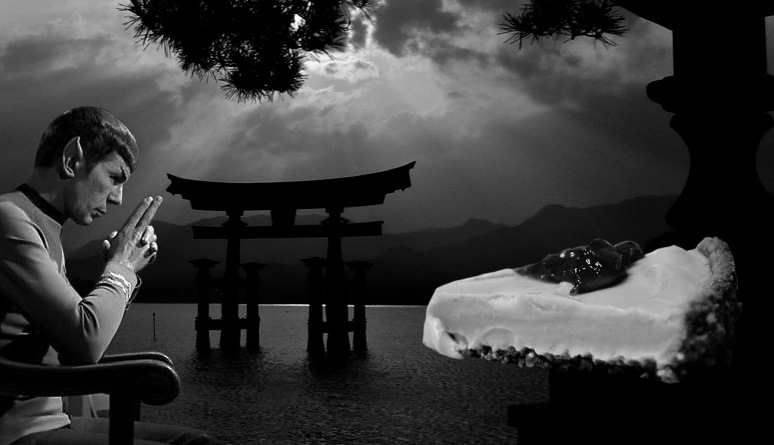 Please enjoy this picture of Leonard Nemoy with a Sunset and piece of Pie, it is totally superfluous. So, I've been working two jobs for the past 6 months. I worked full time at one and part time at the other, usually about 55 hours a week, but, since I'm working at a girls camp for the summer and then off to school in the fall, I got to quit the full time job. It was the best feeling in the world, I'll tell you what (I think of that sentence like Hank Hill said it). It was worth the two jobs when that magical week came when I got two paychecks. It's given me lots of time to plan for camp and to play with my Cricut machine (the most amazing machine known to man, seriously). Otherwise, my life is Boring, is it the summer yet? So, I'm cleaning off my computer, and I found this blog post that I never posted. Thought it was interesting. Again, with the student teaching experiences… Is it appropriate for a teacher to share their personal opinion as if it’s fact? Is it appropriate for a teacher to have political campaign posters dotting the room and stickers adorning their podium, all of which lean to one side of the margin, without any impartiality. As a teacher, I feel it is my responsibility to share information with students and let them decide for themselves which side they want to take. How would I feel as a student in a classroom where my politics diverge from the teacher’s but I don’t feel like I would be able to share that because the teacher’s politics are posted everywhere. And it’s not just in the one classroom, 4 out of the 8 social studies teachers have no qualms about posting political posters in the classroom or sharing their opinions as if they’re facts. It’s no wonder kids don’t have any desire to participate in democracy when they’ve had politics shoved down their throats for so many years. What happened to fairness and impartiality, how is it that these teachers get away with this? It’s enough to make me want to home school my children (this implies I want to have children sometime in my life, which I don’t, but were that to happen, you better believe they wouldn’t be attending this class I’m observing). All of this is still true, honestly, it's one of the reasons I've chosen to go to Grad School instead of actively seeking a teaching job, there is just too much politics in schools, why do we play these games? What am I studying again? After receiving many questions, I have realized that I never actually shared what I'll be studying at Grad School. I actually went to Ann Arbor a couple of weekends ago. It was visiting days for the School of Information. I got a tour of downtown Ann Arbor (complete with a listing of all the bars and their happy hours, not so helpful) I got to meet a lot of new and great people I might be studying with. I looked at housing and found a possible roommate. I got to see an old Brighton friend whose husband is going to school there also and I got to see an insiders view of the area (including some dang good Thai food!). Mostly, I fell in love with Ann Arbor and the University. I'm pretty dang excited for school. Meanwhile, I'm working full time and part time saving up as much money as possible, because I am going to be a really, really poor student pretty soon. So, a decision has been made people. Last week, I was accepted to the University of Michigan and I've decided to go! Yeah for going to school! I'm so excited. Although I've never technically been to Michigan either (I've been to the Detroit Airport!). I'm going to visiting days in March so we'll see for sure then! My first choice school, so awesome! I'm a closet Tom Selleck fan. In fact, a few weeks ago, Mr. Baseball was on and I stayed up until the wee hours watching it, he's just so dreamy and funny. 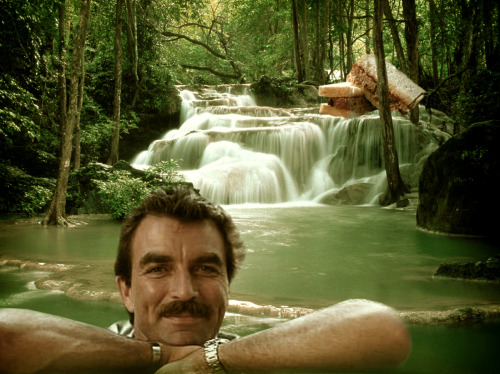 Anyway, found this website the other day, made me laugh out loud, the name of the website is Selleck Waterfall Sandwich. That's all it is, pictures of Tom Selleck, Waterfalls, and Sandwiches. I immediately made this one my desktop background. Awesome.